High-income surcharge based on new brackets next year. As your older clients gather their financial documents to file their 2016 federal income taxes, they should pay close attention to the bottom line on their tax return. Their adjusted gross income in 2016, plus any tax-exempt interest income, will determine next year's Medicare premiums. Many Medicare beneficiaries will be surprised to learn that some of the income brackets which determine Medicare premium surcharges for high-income retirees will change in 2018. Essentially, some higher-income seniors will shoulder a larger share of Medicare costs in 2018 even if their income remains at current levels. Individuals whose modified adjusted gross income (MAGI), which includes tax-exempt interest, tops $85,000 and married couples whose joint income tops $170,000, pay higher premiums for both Medicare Part B, which covers doctor visits and out-patient services, and Medicare Part D, which covers prescription drugs costs. 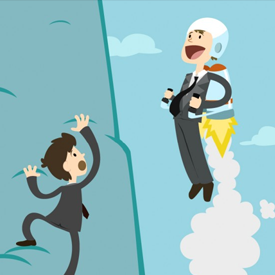 There are five income tiers and if your MAGI exceeds an income bracket by just $1, you are catapulted into the next tier and will pay a higher surcharge. Medicare premiums are based on the latest available tax return, so 2018 premiums will be based on 2016 tax returns filed this year. In 2017, most new enrollees in Medicare Part B pay a standard premium of $134 per month. So do existing Medicare beneficiaries who do not receive Social Security benefits. But most other retirees who have their Medicare Part B premiums deducted directly from their Social Security benefits pay less. That's because a hold harmless provision in the Social Security Act protects most seniors from a net decline in benefits when Social Security annual cost-of-living adjustments are smaller than a scheduled increase in Medicare premiums. In most cases, any increase in Medicare premiums is limited to the dollar amount of the Social Security COLA. Because of the paltry 0.3% inflation adjustment in Social Security benefits for 2017, about 70% of beneficiaries who enrolled in Medicare before 2017 are protected by the hold harmless rule and will pay premiums ranging from about $110 to $126 per month this year. But higher-income retirees pay more. In 2017, premiums that include high-income surcharges for Medicare Part B range from $187.50 to $428.60 per month. Rates are per person, so a retired couple would pay twice that amount. That means married couples whose income topped $428,000 in 2015 will pay more than $10,000 for Medicare Part B premiums alone in 2017. Next year could be even more costly for some higher-income retirees as the income brackets that determine Medicare premium surcharges will be compressed. The initial income threshold of $85,000 for individuals and $170,000 for married couples that triggers a premium surcharge will remain the same in 2018. So will the second income tier of $85,001 to $107,000 for individuals and $170,001 to $214,000 for married couples. But tiers three and four will be compressed in 2018, meaning individuals with incomes between $133,501 and $214,000 in 2016 will be subject to higher premium surcharges in 2018 than they would be today. The same applies to married couples whose 2016 income was between $267,001 and $428,000. They will pay higher Medicare premiums surcharges in 2018 than they would today at the same income level. Individuals in the top tier with incomes above $214,000 and married couples with incomes above $428,000 would continue to pay the highest surcharge. That represents 80% of the per capita cost of the Medicare Parts B and D programs compared to a 25% cost share shouldered by those paying the standard Medicare premiums. Medicare premiums are set each fall to take effect the following Jan. 1. Retirees can be subject to a Medicare premium surcharge if their income spikes for a variety of reasons such as large investment gains, sale of a vacation home, or converting a traditional retirement account to a Roth IRA. If their income later falls, future Medicare premiums may decline. If a retiree's current income is lower than the most-recent tax return, they may be eligible to appeal a Medicare premium surcharge — but only if the income drop is the due to specific life-changing events such as death of a spouse, divorce, marriage or retirement. If that is the case, clients should immediately respond to the premium surcharge notice, known as an income-related monthly adjustment amount (IRMAA) letter they receive in the fall, and follow the instructions on how to appeal the surcharge. Aetna Inc.’s $37 billion deal to buy rival insurer Humana Inc. was blocked by a federal judge, thwarting one of two large mergers that would reshape the U.S. health-care landscape. Aetna said it was considering an appeal. The transaction would violate antitrust laws by reducing competition among insurers, U.S. District Judge John D. Bates in Washington ruled on Monday. Under the terms of the merger agreement, Aetna owes Humana a $1 billion breakup fee. The ruling is a victory for antitrust enforcement efforts initiated by the Obama administration. It may bode poorly for the planned $48 billion merger between Anthem Inc. and Cigna Corp., which was challenged by the Justice Department and is awaiting a ruling. Shares of all four companies declined. “If the judge blocked this deal, there is very little, if any, chance that the Anthem-Cigna deal gets cleared,” Jason McGorman, a Bloomberg Intelligence analyst, said by e-mail. Aetna lost 2.3 percent to $119.75 at 12:56 p.m. in New York. Humana fell less than 1 percent to $200.05. Molina Healthcare Inc., which planned to acquire assets divested by Aetna and Humana, slumped 2.9 percent. Anthem fell 1 percent, while Cigna lost 0.5 percent. The government case against the Humana takeover focused on the market for private health plans for the elderly, known as Medicare Advantage. 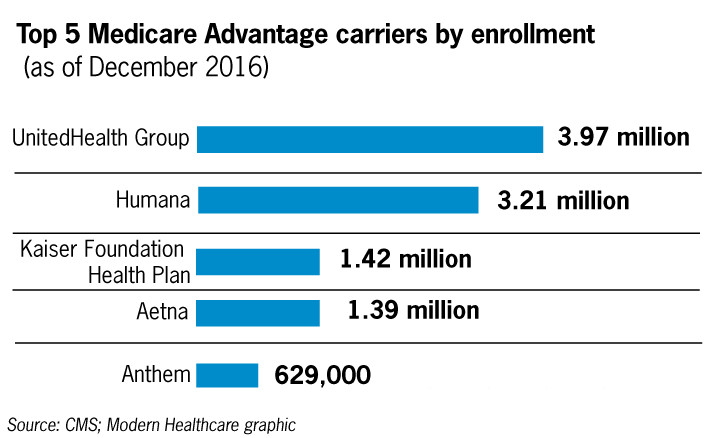 The U.S. argued that the combination of Aetna and Humana would eliminate competition between the insurers in 364 counties in 21 states and probably would drive up seniors’ premiums for Medicare Advantage plans. Aetna countered that the Medicare market is much larger than the Justice Department claims because it includes both Medicare Advantage plans and government-administered Medicare, providing more choice for seniors than the government portrayed. The insurers also offered to sell assets to Molina Healthcare to guard against any risk to competition. 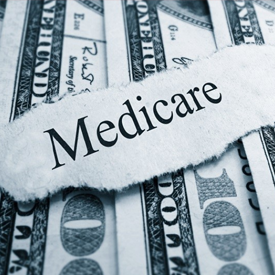 Bates sided with the government, writing that data showed there are seniors who prefer Medicare Advantage and would be unlikely to switch to original Medicare if prices for Medicare Advantage plans rose. The head-to-head competition between Aetna and Humana benefits these seniors with broader networks and lower costs, Bates said. The companies’ proposal to restore competition by selling assets to Molina was insufficient, the judge said. “The companies’ rebuttal arguments are unpersuasive: Federal regulation would likely be insufficient to prevent the merged firm from raising prices or reducing benefits, and neither entry by new competitors nor the proposed divestiture to Molina would suffice to replace competition eliminated by the merger,” Bates wrote. Aetna and Humana will probably turn to other deals to expand, said John Gorman the founder of the Gorman Health Group consultancy. They may look to acquire smaller rivals that specialize in Medicaid, such as Molina, Centene Corp. or WellCare Health Plans Inc.
That’s because states are increasingly turning to private companies to help manage costs in the government health program for the poor, a trend that some of President Donald Trump’s health-care proposals could accelerate. The other part of the government’s case focused on lost competition on the insurance exchanges set up under Obamacare in 17 counties in three states: Florida, Georgia and Missouri. After being sued, Aetna withdrew from those exchanges, and the U.S. asserted that the pullout was meant to avoid scrutiny by the court. Aetna’s lawyers said the withdrawal was prompted by financial losses. Aetna signaled that it may appeal. “We’re reviewing the opinion now and giving serious to consideration to an appeal after putting forward a compelling case,” T.J. Crawford, an Aetna spokesman, said. A Humana spokesman didn’t respond to a request for comment. The Obama Justice Department thwarted several mega-mergers, including Comcast Corp.’s attempted takeover of Time Warner Cable Inc., Halliburton Co.’s deal for Baker Hughes Inc. and AT&T Inc.’s bid for T-Mobile US Inc. The Trump administration is taking over investigations into AT&T’s deal for Time Warner Inc. and Bayer AG’s proposed combination with Monsanto Co. While Medicare Advantage plans added nearly 900,000 members in 2016, enrollment is growing at a slower pace. Still, experts say the future of Medicare Advantage will be lucrative for insurers. “It's the only safe game in town, in all of health insurance,” said John Gorman, a former CMS official who is now a healthcare consultant in Washington. Enrollment in Medicare Advantage, the private, managed care version of the federal health program for seniors, reached nearly 18.7 million as of Dec. 1, according to the latest federal data. Humana, though still No. 2 in plan members behind UnitedHealth, lost nearly 40,000 plan members this year when a large group account went to a private exchange in January. And Cigna, which was sanctioned by CMS in January for failing to comply with the agency's Medicare rules, only enrolled about 4,000 members in 2016. Because of the sanctions, Cigna wasn't able to participate in Medicare's annual enrollment period, which ran from Oct. 15 to Dec. 7. If the Bloomfield, Conn.-based insurer doesn't fix the problems soon, it could see its Medicare membership plummet. Cigna and Humana were both hit by lower quality ratings, which may deter would-be enrollees from picking their plans. Medicaid managed care insurer Centene, which has been investing heavily in its Medicare Advantage business, saw enrollment explode to more than 302,000 from about 34,000 last year, largely due to its recent acquisition of Health Net. While Medicare Advantage enrollment grew 5% in the 12 months since Dec. 1, it has slowed in the last couple of years. It was up 6.8% year over year at the end of 2015 and 9.8% in 2014. Part of the slowdown can be attributed to funding cuts imposed by the Affordable Care Act starting in 2012 and phased in over the last five years, Gorman said. Those cuts were devised to help offset the cost the ACA exchanges and bring Advantage payment rates in line with traditional Medicare. 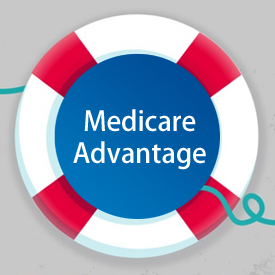 Medicare Advantage rates are based on the trends and utilization of traditional fee-for-service Medicare plans and adjusted for plan members' risk scores. Before the ACA, Medicare was paying private plans at a much higher rate than the cost of fee-for-service benefits. They reached a high of 114% of traditional Medicare payments in 2009. But the Medicare Payment Advisory Commission said in December that payment rates have evened out. First and foremost, Happy New Year! We hope everybody had a great 2016 and we look forward to making your 2017 even better. 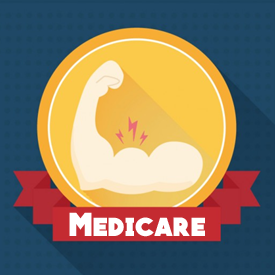 This brief gives a quick summary of Medicare’s strength, popularity, and status as a bulwark against unaffordable, low-quality health care. As we enter a new era of conversation in the health care sphere, it is important to base our conversations and arguments on facts, not fiction. The facts about Medicare are that the program has lifted generations of older Americans out of poverty, has provided life-preserving health care to millions including people with disabilities and serious chronic conditions, and is a proving ground for innovations that look to provide better care and smarter spending with the aim of achieving healthier people. Highlights of the brief include facts about people with Medicare, the program’s financial future, and stories from the Medicare Rights national helpline. Medicare Rights will be releasing further briefs on other aspects of the debates surrounding health care and Medicare in the upcoming weeks: the ways the Affordable Care Act interacts with and supports the Medicare program; the impact of various suggested changes to Medicare including privatization through premium support or vouchers; raising the eligibility age; changes to bans on private contracting or balance billing; and other potential structural redesigns.